Our Chianti Riserva is sourced from the hills surrounding Vinci, Italy. Here the vineyard rows - where the slope will allow - are laid out perpendicular to the maximum gradient and are generally south-facing to guarantee more sunlight during the day. The Chianti Riserva is fermented in 100% stainless steel tanks and is temperature controlled between 82°F and 85°F to ensure excellent color and supple tannins. Once fermented to dry, the wine is then aged in French and American oak barrels and finally in bottles. In total, this wine is barrel and bottled aged for 2 years and 9 months before leaving the winery. The Chianti Riserva has a distinctly fruity bouquet with dark cherry overtones that are balanced with hints of vanilla and cinnamon. 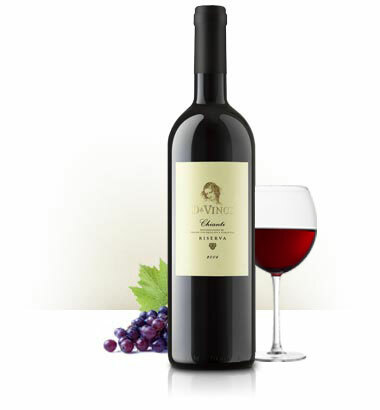 Its flavor reflects the fruit of the bouquet and is supported by balanced tannins. You will notice flavors of concentrated black fruit, plums, and ripe cherry fruit with spicy undertones all balanced by fine soft tannins and a full mineral finish.